No one wakes up in the morning and says “I think I want to be in poverty today” or “I want to apply for food stamps”, [or] wakes up with the enthusiastic goals of sitting in the county assistant’s office or waiting in the pantry line. This week’s featured article is “Republican Judges Take Another Shot at ObamaCare“. In “Republican Judges Take Another Shot at ObamaCare” I explain why I don’t think this crisis is going to take down ObamaCare either. Every day or two there’s a ceasefire proposal, but so far nothing has lasted. My article last week drew a lot of comment from both sides, on the blog as well as via private email. I do regret one thing: referring to the Hamas missile attacks as “pinpricks”. That was insensitive. But I stand the larger point I was making: that the risks to Israelis are not remotely on the same scale as the risks faced by Gazans. One Fatah negotiator said that negotiating with Israel over land is like negotiating with a guy over a pizza while the other guy keeps eating the pizza. Recall that the next time you hear some Israel politician claiming that all Israel was doing was minding its own business when Hamas started shooting missiles at it. Today’s NYT has an article by Israeli writer David Grossman. He voices a where-does-this-end perspective similar to what I was trying to evoke last week. His metaphor of Israelis and Palestinians alike trudging around a grindstone is very apt. He sees more reason for hope in the current Israeli national conversation, and I can only hope he is better plugged in than I am. I read Ryan’s new report Expanding Opportunity in America and am writing a review of it, but I ran out of both time and my word limit. So that will post next week. In the mean time I invite you to go back and look at my review of Ryan’s previous report on poverty The War on Poverty: 50 Years Later, which came out in March. Much of what I pointed out there still applies: Americans by-and-large agree on what to do with people who are poor for various reasons. The disagreement is over how many people fall into the various categories (i.e., how many lazy able-bodied people we’re talking about), and how many genuinely needy people we’re willing to cut off in order to stop one moocher. You might also read these articles for and against Ryan’s ideas. Another worthwhile thing to look at is what happened when Ryan let an actual poor person testify to his committee. That’s who I’m quoting at the top. BTW, last week I complained about the misuse of the term “blank check” in Republican rhetoric. A blank check is literally a signed check where the amount has been left blank, so that the recipient can fill in whatever amount is desired. So no proposal that has a specific dollar total attached to it — like President Obama’s $3.7 billion proposal for dealing with the Central American refugee kids — can truthfully be described as a blank check. Now, this is the same kind of misuse, because a block grant is for a specific amount. But I now get the meaning: a check with no strings attached. (That interpretation works in the refugee kids proposal too.) They could just say that, of course, but wanting to attach strings sounds more sinister than refusing to sign a blank check. This is how you use language when you don’t want your listeners to think clearly about what you’re saying. Friday, Rachel Maddow did a great piece on the general dysfunctionality of Congress. She began with a harmless, but spectacularly embarrassing episode Thursday, when new Florida Congressman Curt Clawson (during his first day on the Asia and Pacific subcommittee of the House Foreign Affairs Committee) apparently thought two dark-skinned U. S. government officials were actually representatives of India. “I think your question is to the Indian government,” one replied. Then there are the bills passed (or not passed). The recent low was the 104th Congress of 1995-1996. Newt Gingrich was fighting Bill Clinton, and only 333 bills passed in two years. 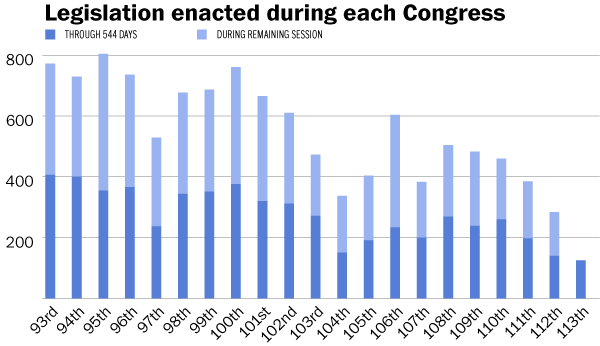 Then the 112th Congress (2011-2012) got even less done: 284. This Congress is on pace to do even less. And there is a case to be made that the numbers don’t tell the full story: The quality of what gets done makes it even worse. The 112th Congress, for example, did manage to avoid a government shutdown; the 113th didn’t. Immigration reform apparently is impossible. An emergency bill to do something about the refugee kids is apparently impossible. Keeping the Highway Trust Fund from going dry was so tricky that it required an accounting gimmick. We’ll be lucky if we avoid another government shutdown. This was all to lead up to Maddow’s main point: Even after all the scandal about the Veterans Administration and about veterans who have died waiting for medical care, Congress may adjourn for their August vacation without doing anything about it. Apparently, that last possibility isn’t going to happen. Democrat Bernie Sanders and Republican Jeff Miller are supposed to announce a compromise this afternoon. I finally got around to seeing Frozen, and I note an interesting similarity to Maleficent: The true love that will heal a girl is not romantic love. Finding your handsome prince is not the ticket. Nothing really new about the Central American refugee kids. It seemed like Congress would have to pass something before its August recess, but now it’s not clear whether they will. Do you have First World Problems? Paul Ryan knows once you turn these programs into block grants, you can then whittle away at leisure, likely down to zero. He is hell bent on taking from the poor to give more money to ‘The Producers’, which is the new term they like to use. No successful person I know made their money all by themselves, they had lots of help.